We joined a local bottle shop for one reason only. This reason is to get a wide variety of red wines. When you join a winery wine club you are limited. Granted, Chris and I are members of a few clubs in Napa Valley, and will remain for many years to come, it is good to have variety. Washington wines are on the top of my list. When we visited Walla Walla a few years back we did come across some wineries that produced excellent wines that are more affordable than California. 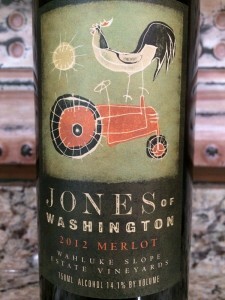 Our April Wine club pickup had a bottle of the 2012 Jones of Washington Estate Merlot. The Merlot is an estate wine from the Wahluke Slope. 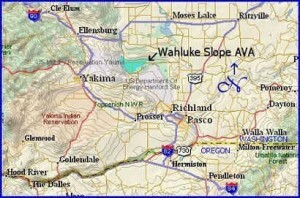 Where is the Wahluke Slope in Washington State? 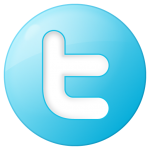 Established in 2006 Naturally bounded by the Columbia River to the west and south, by the Saddle Mountains on the north, and on the east by the Hanford Reach National Monument. The Wahluke Slope AVA lies entirely within the established Columbia Valley appellation and is home to more than 20 vineyards and at least three wine production facilities. The 81,000 acre region features approximately 8,491 acres of vineyards: nearly 15 percent of the total wine grape acreage in the state. Top grape varieties: Merlot, Syrah, Cabernet Sauvignon, Riesling, Chardonnay, and Chenin Blanc. Wahluke Slope has one of the driest, warmest climates in the state, allowing nearly complete control of vine vigor and ripening through irrigation. Moderate young-fruity aromas of dark fruit including blueberry and cherry. A slight aroma of spice. Dry, full-bodied with balanced acidity. Slightly astringent tannins but very integrated. Rich mid-palate mouthfeel with a long flavorful finish. How much: $14.99 at the website. A great price for this wine. 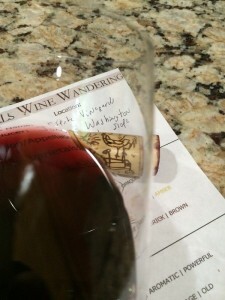 The 2012 Jones of Washington Estate Merlot is a great wine for the price. I would buy it again. I rated it four glasses.